Cristóbal Balenciaga, the elder statesman of the avant-garde, Spanish Civil War refugee, designer mentor to Hubert de Givenchy and André Courrèges, died in 1972. But a new exhibit of some of his best work sheds light on his complicated life. The Balenciaga show opening at the Queen Sofia Spanish Institute in New York today is subtitled "Spanish Master," and it turns out the museum means to emphasize the first word just as much as the second. The 76 garments and accessories that comprise the show are presented alongside notes about Spanish history, works of Spanish art, and pieces of Spanish regional dress that highlight the couturier's relationship with his native land. 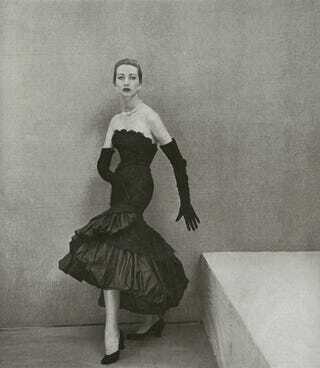 Balenciaga flamenco-inspired evening dress, 1951. Photo by Henry Clarke for Vogue. Suddenly, the voluminous cloaks Balenciaga favored for evening warmth look almost like clerical robes, his many gowns with doubled-over trains recall the shape of a folded bullfighter's cape, and his famous sack dress of the mid-1960s resembles nothing so much as a fisherman's smock. Evening coat, scarlet silk ottoman, Winter 1954. Cristóbal Balenciaga Eizaguirre was born in a Basque fishing town in 1895 — which means that Balenciaga was in his seventies when he was designing the fluid, avant-garde creations for which he is so well-known — and in fact, the designer's father was a fisherman. His mother was a seamstress, and after his father's death, in 1901, Cristóbal began helping her with her work. At age twelve, he was apprenticed to a tailor, and as a teenager, a local noblewoman who was one of his clients paid for Balenciaga to go to Madrid, where he could study tailoring in the English tradition. By age 24, Balenciaga's custom designs were popular with Spanish royalty and the upper classes, and he opened a salon in the resort town of San Sebastián, followed by two others in Madrid and Barcelona. Evening dress, pink silk faille, Winter 1960. The most productive and creatively important segment of Balenciaga's career is bookended by two world-altering events: the Spanish Civil War and May 1968. The former forced Balenciaga to abandon his business and relocate to Paris, where he presented his first collection in August of 1937, some four months after Guernica. In 1968, Balenciaga retired, and as it happens he showed his last-ever collection in May, "on the even of Paris's student riots," as show curator (and Vogue European editor-at-large) Hamish Bowles writes in the exhibition notes. Just as Balenciaga's career was culminating in silk gazar dresses that are to the body what the swoops of aluminium Frank Gehry would later favor are to architecture, the students' and the trade unions' anti-consumerist free-love revolution were making couture and its moneyed, establishment customers obsolete. Left: Cocktail dress, black silk gazar, rhinestones, faux pearls. Fabric by Abraham. Winter, 1967. Right: Evening dress, lime green silk gazar. Fabric by Abraham. Winter, 1967. You can see part of Balenciaga's Summer 1960 show on YouTube. The show at the Queen Sofia Spanish Institute is small, filling just two rooms — although it will be expanded next spring, when it travels to San Francisco's De Young museum — and perhaps doesn't explore the contemporary context of Balenciaga's work as fully as it could. Red and white, for example, are traditional Basque colors, and they are also colors the designer favored heavily — even as the Basque language and culture was being ruthlessly suppressed by the victorious General Franco. Is the color preference a mute signifier of cultural pride, or a total coincidence? The show doesn't go there. Maybe people don't want identity politics in their fashion. But given that Balenciaga worked within the Spanish vernacular, I wanted to know more — not just about the kinds of armor Spanish kings wore in the Middle Ages and whether or not this armor is intentionally recalled by beading Balenciaga used on a mini-dress, but about Spanish regionalism during the late 19th and early 20th Centuries, and what Balenciaga's relatives did during the war, and whether he was free to (or chose to) visit his homeland after the war ended. But the show also has some fascinating insights. From a note on Spain's colonial history, I learned that the embroidered silk scarves that are so strongly associated with traditional Spanish dress (and particularly with flamenco dance) were actually first introduced to the Iberian peninsula after Spain took possession of the Philippines, in the 16th Century. The scarves were made in China, embroidered there or in the Philippines, and then exported to Spain, where they became tremendously fashionable. And so what is now a symbol of Spanish culture — and a sumptuously embroidered example from the 1920s hangs in the show — proves to be, upon further research, an Eastern import/colonialist artifact originally desirable for its very exotic-ness. Balenciaga, working with the French embroidery house Lesage, designed several fabrics that took inspiration from the Chinese-Spanish silk scarves. Mantón de Manila, designer unknown. Silk, polychrome silk floral embroidery, c. 1922. Evening dress, Balenciaga. Ivory silk, polychrome silk floral embroidery by Lesage. Summer, 1964. "Balenciaga: Spanish Master" also includes a black evening dress designed for Balenciaga's Winter 1967 collection. Accompanied by a voluminous black wrap and a matching hat, the wall copy points to Goya's 1797 portrait of the mourning Duchess of Alba, who is wrapped in a black lace mantilla, as a corollary. (Anyone in New York City who hasn't done so should take a trip to the Hispanic Society of America museum, where the painting, along with numerous other works by such artists as Velazquez, El Greco, and Sorolla, is displayed. It's free.) Balenciaga also named Velazquez's portrait of the Infanta Margarita as the inspiration for his Winter 1939 collection, and when he became successful, he collected contemporary Spanish art, including Miró. Seeing Balenciaga's more abstracted later work in light of Miró — a connection the show makes — somehow improves them both. Balenciaga evening ensemble, 1967. Photo courtesy of Balenciaga archives, Paris. Here Balenciaga is in his salon in 1958, going about his work wearing a white coat like a lab tech. Thanks to his training as a tailor, Balenciaga was one of the few couturiers who could build a dress from scratch. His impressive technical skill is relayed by such garments as an expertly stabilized day dress in bias cut wool jersey. Even the bound buttonholes are on the bias. In a Summer 1964 polka-dotted evening gown (polka dots were a Balenciaga fixture), tiny, evenly matched puckers signify the presence of a perfectly hand-set zipper. What happened after Balenciaga retired in 1968 is also not part of the narrative of the show, probably because it is a fairly sad (but commonplace) fashion story. Although Balenciaga wished for his house to close, there was simply too much money at stake for his label not to continue, and in truth his licensing contracts prevented it. After Balenciaga's death, in 1972, his nephews authorized more licenses, and then they sold their stakes. The Balenciaga name, and the many perfumes, scarves, and accessories it was attached to, was passed around by various corporate owners until in 1995 a young Frenchman named Nicholas Ghesquière found himself working at, in his words, "what many would call the worst position in fashion": designing uniforms for a Japanese Balenciaga licensee. When Gucci Group acquired the brand, in 1997, Tom Ford promoted Ghesquière to head of women's ready-to-wear. And now Balenciaga sells avant-garde high-end clothing, shoes, and handbags to the very wealthy once more. Left: Dinner dress of black silk satin with white polka dots. Winter, 1953. Right: Evening dress of white silk satin organza with black dots. Summer, 1964. Balenciaga worked with a thoroughness and a knowledge of the processes of design and dressmaking that were unusual at the time, and are even more so today. We used to understand design, tailoring, and couture sewing as significantly coextensive territories: now it's far less likely that designers share the skills of their petites mains, if they even have a couture salon. And as Louise Wilson, the head of the fashion design Master's program at London's Central St. Martin's once said, "Everything is farmed out. Someone else is going to cut it, and someone else is going to supply the fabrics. The hands-on gets more and more removed." (Wilson named Alexander McQueen, who like Balenciaga trained as a tailor, as one designer who still possessed the skills to enact his vision even if he "had nothing.") And yet, even as designer clothing is increasingly mass produced, it's certainly not the case that ready-to-wear clothing has become any more attainable for the average woman. Oscar de la Renta, who chairs the Queen Sofia Spanish Institute's board, was at Tuesday's preview of the show. When asked if any contemporary designer approached Balenciaga's rigor and level of skill in both design and construction, he thought for a second, and then said, "No. No, I don't think so." Left: Evening dress. Eau de nil silk moiré, gold lace, metallic embroidery and beading. 1957. Center: Evening dress. Black silk velvet, rhinestone, and bead embroidery. Winter, 1967. Right: Evening ensemble. Ivory linen dress with navy blue silk chiffon bodice, ivory linen capelet. Summer, 1965.